Halve and pit the cherries. Fine chop the shallots and saute them with a pat of butter and a couple pinches of salt in medium heat until they are barely transparent. Next add the wine, vinegar, water, and sugar and bring to a boil. 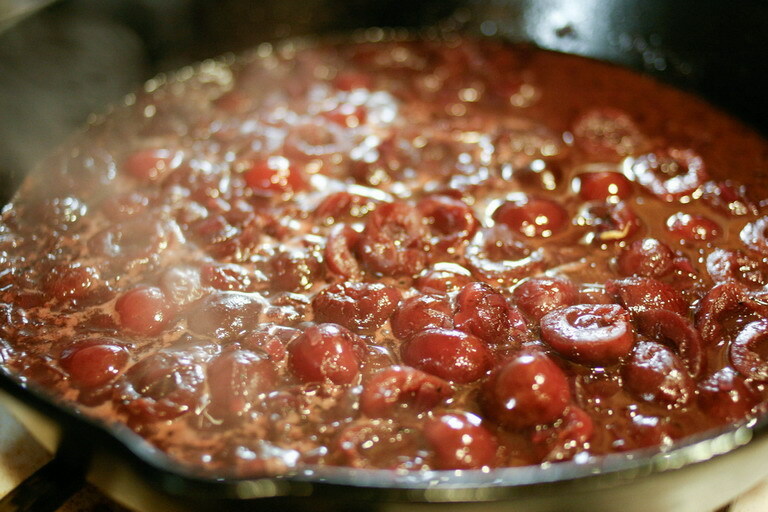 Once boiling, lower heat to a simmer and add cherries. Reduce the sauce until there's about half the volume left or until desired consistency. Remove from heat and stir in a couple pats of butter to make the sauce creamier. For the choice of red wine, any inexpensive bottle should be fine. I was looking for a sweeter sauce so I opted for a merlot, but you can certainly use a drier wine if you prefer.